Also, on the Yahoo music/Pepsi blog there’s an AMAZING Q&A from’s Alicia recent appearance at NYU! ALICIA KEYS single artwork is here! 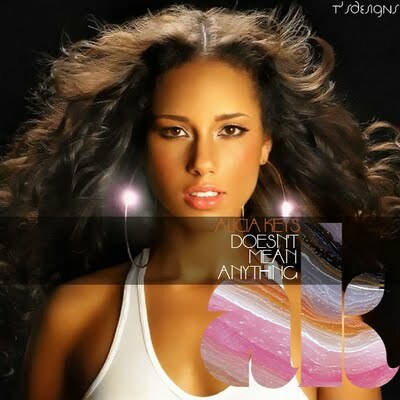 Check the just-released UK artwork for Alicia’s single Doesn’t Mean Anything… and mighty fine it is too! Doesn’t Mean Anything is released November 30th. The album The Element of Freedom drops December 14th. Hot new clips from ALICA KEYS! Alica has just uploaded the 2nd track from her upcoming album The Element of Freedom. The track’s entitled Try Sleeping With A Broken Heart, and is K-I-L-L-E-R! Also, if you haven’t seen it already, take some time to watch the amazing video for New York State of Mind. The Soul Food Weekend list! – performed on Later Live earlier this week. Simply outstanding. After Maxwell rocked Birmingham on Wednesday, he’s set to wow crowds in Manchester and London this weekend. – first video from the beautiful new album ‘The Makover’, praised in a 4* review in Pride magazine as “musically progressive, passionate and innovative “. News just in, Alica Keys is making us wait a little while longer for ‘freedom’ . . . but it’ll be worth it! The 12-time Grammy award winning singer/songwriter/pianist has delayed the release of her highly anticipated new album, The Element of Freedom, originally slated for release on November 30 to December 14. But she promises the extra two weeks of waiting will not be in vein. She’s still hard at work recording new songs for the set and the “amazing” results are precisely why she needs a little more time to unleash her fourth studio album. The new songs will join her first single, Doesn’t Mean Anything, which is currently rising up the Billboard Hot 100 singles chart – and set for release in the UK November 30. The Element of Freedom will follow-up Alicia’s critically acclaimed album, As I Am, released in 2007. Alica dropped by BET’s buzz show 106 & Park yesterday to talk about the killer single DOESN’T MEAN ANYTHING, the album THE ELEMENT OF FREEDOM and her hot new video! Alicia Keys turns it out on Regis & Kelly! Ok, so we think Alica’s forthcoming single DOESN’T MEAN ANYTHING is something pretty special… but hearing it live takes it into another dimension! Alica was a guest on Regis & Kelly in the U.S last week, and her live performance of the song with her band and killed it!